Help with ideas on making a basic summer quilt, please? Thread: Help with ideas on making a basic summer quilt, please? I'm a beginning quilter who has to do a lot by machine b/c my health's not great. I need a great, light-weight blanket for summer here in phoenix, and not able to find anything light or cool enough I've bought 2 king-sized white, cotton sheets and a king-sized piece of warm and natural batting. I was thinking that maybe sewing intersecting straight lines at 10"or less intervals would keep the batting from shifting. And I've found a nice pattern on continuous prairie points that I thought might look nice and still be done pretty easily. 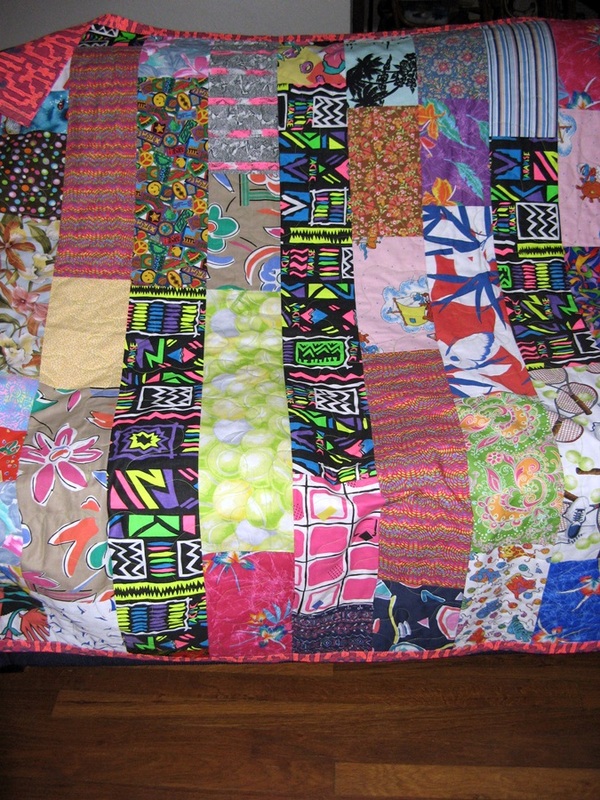 I'm wondering, though, if I ever wanted to come back after the blanket's completed and quilt a little, could I do that? Also, I'm looking for easy ideas for adding a little color to the internal space of the quilt. I appreciate the help. Thanks so much! So am I understanding that you are going to put prairie points around the quilt? Warm and natural batting is fairly warm and IMHO will be too warm for your heat. I've been there I know. Why not just leave it out and quilt the two sheets together. Use colored or variegated thread so it will show. You could go back later and add more. Consider using fabric paints to paint a design on your sheets. You can also use fabric crayons. Tesspug has some great suggestions....maybe you could just machine applieque some simple shapes using scraps, then put the backing sheet on and as she suggested just quilt the two sheets together. I just saw a terrific summer quilt done by a quilting friend of mine. We live in Las Vegas, so we know all about the heat, and it's heating up early and plans to be a hot summer! Anyway, I friend found a beautiful piece of fabric, multi-colored, in an African print, 54" wide and 6 yards long priced at $3 for the whole thing at an estate sale. She used my favorite summer batting, which is diaper material -- very thin and light, very breathable, but it adds body to the quilt. Then she backed it with natural muslin (double washed, as per protocol, to ensure complete shrinkage.) 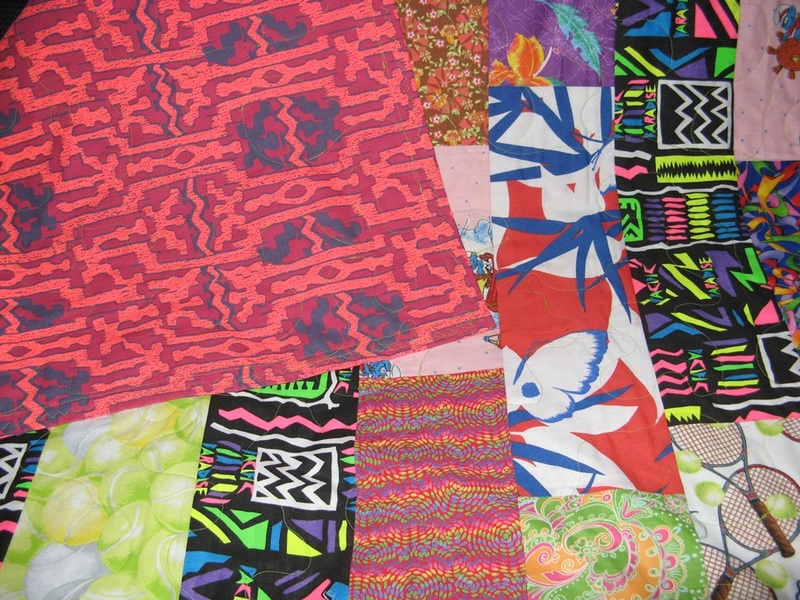 By using 3 yards of the African Print, she was able to put a top together that was about 53" (minus selvages) by 95" long. She is tall and likes the longer quilt, but the point is, the quilt could be made any length depending on how many yards you get. Then she spray basted and pinned it together, quilted around the shapes in the African print, put on a solid colored binding (which could be optional) out of fabric in her stash, and it really set off the blues and yellows in the African print. Ran it through a quick cold wash and tumble dry low. It's a perfect summer quilt, light as a feather, breathes extremely well (which two sheets sewn together might not, especially if they are a poly-cotton blend), and it both durable and beautiful. She said she did the whole thing in 3 days, working on it part of each day. Just an option to think about. If you're dying to do the sheet type, I'd hit all the thrift shops until I found a colored sheet top I liked. Then just baste them together, and use a simple overall quilt pattern. I like the idea of using contrasting thread. Binding is optional, but it can add color, and can be store bought cheaply, or made from your shash. And machine bind it -- don't bind the back by hand. Think: KISS - keep it simple and stupid. By "stupid" I only mean made by basic skills, not fancy ones, not that you have to be stupid about it. Just my thoughts! Good luck with whatever you choose to do! I just made a summer quilt for my family to use at the beach, in the car, or where ever and can be washed whenever you want, etc. I used left over fabrics from years past shorts and clothing I had made. I used a cotton fabric for the back a flannel sheet in the middle for batting and the the long pieces from the shorts of the past. Not heavy and so easy to do. You can also just take two pieces of fabric and not put anything in the middle and it can still be quilted or whatever you would like to do, like tie it. Wild and crazy isn't it? Fast and fun. Great for the kids for camping or whatever. I made one of each member of the family. All good suggestions above. Personally, I love to applique, so I would add bits of color whereever I wanted in a randomly and freecut style. OR you could stitch tou sheets together with your prairie point design and then decide where you want color and free cut pieces to "fit" within the thread lines by fusing them on. You could even stitch them down using decorative or straight stitching, colored/invisible/multi colored thread for a different look. It will be great! However, I agree that warm and natural may be too warm for you. I am not real familiar with this so I suggest going to warm and natural's website and reading about their different battings. I know there are bamboo battings but I really don't know which would be best for your needs. Perhaps no batting? This is a great thread! Thanks for all the ideas for easy, simple summer quilts!